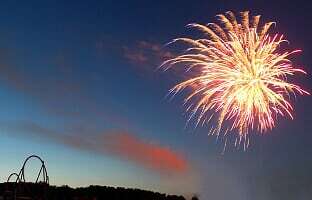 SANTA CLAUS -- Visitors to Holiday World & Splashin' Safari on the next five Fridays, plus the 4th and 5th of July, will end their day with a patriotic fireworks celebration. The fireworks displays will begin shortly after Holiday World closes for the evening at 9:00 pm CDT (10:00 pm EDT). The fireworks will be launched from the northeast side of the park. The best place to view the fireworks is from Holiday World’s Thanksgiving section and the Hyena Falls portion of Splashin’ Safari. Back this year on the 4th of July are free souvenir 3D Fireworks Glasses, for viewing the fireworks with an added dimension. Character masks to wear over the 3D glasses are also available for 99 cents. Holiday World is the only park in the nation with a “4th of July” themed section. Holiday World & Splashin' Safari were recently awarded a 2018 TripAdvisor “Certificate of Excellence” following another year of positive reviews from visitors. According to TripAdvisor, only the top 10 percent of attractions, restaurants, and lodging worldwide receive a Certificate of Excellence. New at the parks this season are Tembo Falls junior water slides and Tembo Tides junior wave pool in Splashin’ Safari. Both parks also added new live entertainment this season. For more information, visit HolidayWorld.com or call 1-877-463-2645.